Lake Ontario Trout and Salmon Fishing…, Spiny Water Fleas, Ugghhh! When Grant boated this king salmon on July 30, 2015, the water fleas weren't quite as bad as they had been the previous few days. If you have fished Lake Ontario in the past week or so, you have been introduced to the dreaded, ooky, fishing line clinging, spiny water flea and fish hook flea, better known to biologists by their Latin name, Bythotrephes longimanus & Cercopagis pengoi. Here’s some info on exactly who and what they are, provided by “Ontario’s Invasive Species Awareness Program”. Spiny and fishhook waterfleas are small aquatic predators native to Eurasia. The first report of spiny and fishhook waterfleas in North America were both in Lake Ontario – spiny waterflea in 1982 and fishhook waterflea in 1998. Both species were introduced to the Great Lakes in ballast water from ocean-going ships. Both waterfleas are species of zooplankton – small animals that rely on water currents and wind to move long distances. Spiny and fishhook waterfleas prefer large, deep, clear lakes, but can also be found in shallower waters. Spiny waterfleas move to deeper, cooler waters during the day and swim towards the water surface at night to feed, while fishhook waterfleas stay near the surface. Both species are able to reproduce asexually, by cloning, and also sexually, and can multiply very quickly. When they reproduce sexually, the eggs can survive through the winter on lake bottoms and can be transported long distances on boats or equipment if they stay moist. The main diet of spiny and fishhook waterfleas is other zooplankton. The spiny waterflea has been found in all the Great Lakes and in more than 100 inland lakes in Ontario. The species has also been reported in Lake Winnipeg and the Winnipeg River in Manitoba. It is not known to be anywhere else in Canada, but has been found in inland lakes of American states that border the Great Lakes. The fishhook waterflea is established in lakes Ontario, Erie and Michigan, as well as some inland lakes in upstate New York. Researchers believe that spiny waterfleas are the greatest threat to the biodiversity and structure of native zooplankton communities on the Canadian Shieldsince acid rain. Because their main diet is zooplankton, they reduce food supplies for small fish and the young of sport fish such as bass, walleye and yellow perch. A few animals can quickly multiply into a large population. They are easily spread between waterbodies on angling equipment and bait buckets and in live wells and bilge waters. Spiny waterflea introductions result in an average 30 to 40 per cent decline in native populations of zooplankton. Spiny and fishhook waterfleas can affect recreational angling and commercial fishing. Their tail spines catch on fishing equipment, making it difficult to reel in lines, and clogging commercial nets and trawl lines. 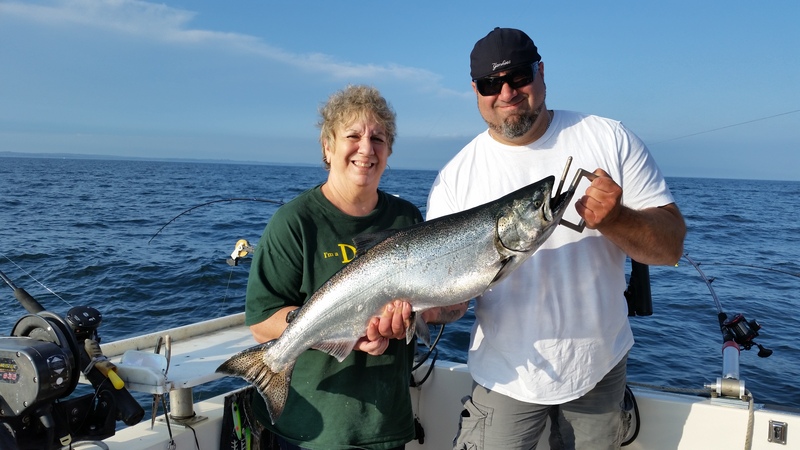 Joe Winot and his mom Darlene double teamed this king to the net on 200' of copper. After I wrote the article, “Copper Magic” which appeared in a 2006(I think?) issue of Great Lakes Angler, lots of trollers read about the benefits of trolling copper line, including the mystical electrical attraction of fish to wire, and the fast sink rate, 1.65 times that of leadcore. Most anglers who tried copper raved about their success catching trout and salmon with it. A few had problems, mostly with (1) depth control, (2) kinks and breaking, (3) and attaching backing and leader to copper. Since then, copper line has become the rage on the Great Lakes. Lots of anglers have mastered it’s use, but many, including folks new to fishing copper, still have some problems with it. Depth Control – So, you spooled up with an unknown amount of line and you’re on the water. You’re seeing kings on your fish finder at 66 feet and want to put drop your copper rig right to that depth. Good luck. You’re just guesing unless you know precisely how much line you have in the water. The .037 diam. copper line I use sinks at a rate of 22 of depth per 100 feet of line at a speed of 2.7 mph when fishing a spoon. Dodgers and rotating flashers, which have more resistance in the water run shallower. To control the depth at which you’re fishing with copper, you must either buy premeasured sections of line, or measure it yourself. When I rig reels for fishing 100 to 500 feet sections of copper from inline boards I accurately measure it with a 200 foot surveyor’s tape. For copper rigs that will be fished straight off the boat, I measure the wire and at 25 foot intervals code it with shink tubing or thin strips of adhesive tape from Johnson and Johnson Band-Aids or . If these strips are applied tightly, just a couple of wraps, they will last for many years. Unless the diameter of shrink tube is small enough and it is heated enough, it will slide on copper line. 30# test – 4.03 oz. 35# test – 5.55 oz. With the 35# test, heavier gauge line weighing 36% more than the lighter gauge, you can bet the heavier line sinks quicker. Kinks and Breaking – One of the characteristics of wire line, even soft, multistrand copper, is that it has memory. It is just the nature of the beast. Get some slack in it, and a loop will form. Put tension on the line and the loop tightens into a kink that will eventually break under pressure. Avoid slack line and you’ll avoids kinks. Yeah, but what about those “Mystery Kinks” that appear even when you’re being really careful? Well, chances are you’re letting your line out to fast, about the same way you let out lead core. What’s happening is you’re letting out line fast enough that your terminal gear plus the speed of the boat isn’t pulling the line tight enough and as the line freefalls, it forms unseen loops underwater. When you stop letting out line, the loops tighten and form kinks. You let it out in perfect shape, but when you reel it in, you have dreadful and costly “Mystery Kinks”,or is it just work of the deep water copper devil! If you’re fishing copper on inline boards, especially my personal favorites, Church Walleye boards with metal releases, DO NOT clip the copper wire directly in the release. Do not clip or wrap copper wire in any release. Clip the backing in the release, instead. Trust me, or pay the price! Four years ago, I switched from inline boards to large, triple “megaboards”. Towed on 300 lb. test mono tether line, they’re capable of fishing three sections of copper line as long as 600 feet without the board dropping back. I use Scotty downrigger releases snapped intp a ¼” diameter spring clip(available at Lowe’s, etc. ), which is clipped on the tether line.. These big boards are a bit bulky to store onboard, but they do an awesome job in the water. Attaching Backing and Leader – Nothing is more frustrating than losing fish, gear, and copper line because the attachment between backing and copper broke. If you want to minimize this unpleasant, blood pressure raising experience, use Size 3, 150# test heavy Spro swivels to attach backing and leader to copper line. Spool on 35# test Cortland Spectron, tie an overhand loop knot in it, thread the loop through one eye of the swivel and loop it around the swivel. Spin the last 6 inches of the copper line to tighten the twist in it, slide the copper through the eye of the swivel and then twist the loose end of the copper tightly to secure it. Spool on the measured length of copper, attach the opposite end to another Size 3 Spro swivel in the same manner, and then tie on the mono leader with your favorite knot. Voila! Oh, and one other thing. Beware the Twili tip if you’re using braided line backing. The sharp end of the stainless coil spring wire can saw through braided line, especially Dacron. Believe me, 300 feet of copper can sink a Church Walleye board! How do I know? You guessed it! One of many comments I received about fishing copper line was from Capt. Ed Retherford, who fishes Trout Scout V on Lake Huron out of Alpena, Michigan. Ed fished copper to help him place 6th out of 115 boats in the Michigan Brown Trout Super Tournament and to place his crew 5th out of 123 boats in the Ladies Michigan Brown Trout Tournament. Shame, shame on you Ed for sneaking around Alpena for two weeks without telling anyone, including your kids, you started fishing copper! Lake Ontario Trout and Salmon Fishing…, Salmon Bite is on!!! Dave and Angela Brown with a double on kings on the afternoon of July, 17, 2015. 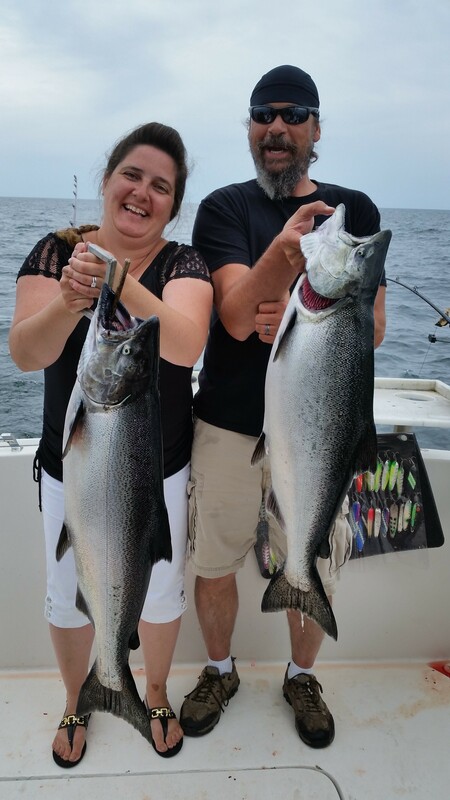 Ask Joe and Darlene Winot, their son Joe, Jr., and Joe’s kids Carter and Gage and they will tell you, “The king salmon bite is on in Lake Ontario.”, minutes away from Oswego Harbor. The Winot family fished aboard the Fish Doctor this past weekend on July 18 and 19. On Saturday morning when my crew for the day arrived at the dock , the weather was raunchy with lightning flashing, thunder booming, and a torrential downpour literally dampening my angler’s spirits. That storm blew by quickly though, and only delayed our 5:00 AM departure a few minutes. Very often, after a thunder storm, king salmon turn on, and that is exactly what was about to happen as I rigged our downrigger lines and we started trolling. The first hit was a screamer, a big king peeling line off the reel as the clicker on the reel buzzed a “Wake up!” alarm. I had an ace up my sleeve, having located a hot spot the previous afternoon, far from any other boats and we trolled steadily towards it. Not seeing any bait or fish showing on the 12” Garmin fish finder for nearly a half mile after we caught our first king, I was starting to wonder if things had in 12 hours. They hadn’t. As soon as the schools of alelwives, a king salmon’s favorite forage, showed up on the fish finder screen, the rods started popping. Before the bite was over, the cooler was full…, 11 king salmon up to just over 20 lbs., plus two nice lake trout. The next day was a near repeat of the first, with slightly fewer but larger kings boated, the biggest 24 lbs. 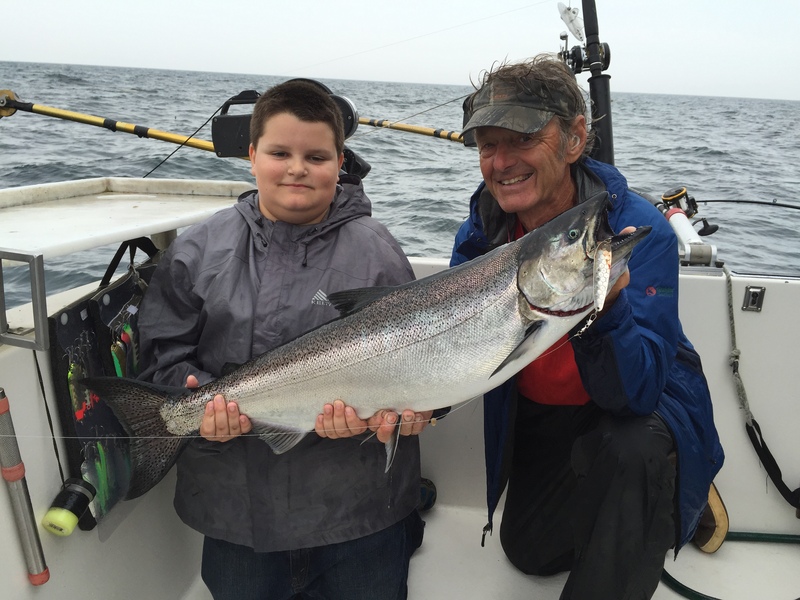 If you’re thinking of booking a king salmon trip, now is the time and Oswego is the place. This 22 lb. Fish Doctor king salmon was boated on July 16, 2015. 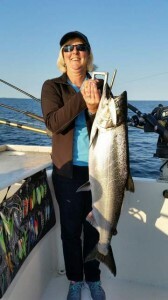 If you’re thinking about booking a Lake Ontario trout and salmon fishing charter, you could not pick a better time than right now, and you could not pick a better port to fish out of than Oswego Harbor. Parties aboard the Fish Doctor have been enjoying some excellent king salmon fishing in the past week, plus they have been boating browns, steelhead, and lake trout. This is typical midJuly fishing out of Oswego Harbor with surface water temperature warming, vast schools of alewives moving offshore after spawning, and trout and salmon concentrating in the cooler depths to chow down on their favorite forage. In the past few days Fish Doctor anglers have boated kings up to 22 lbs., steelhead up to 8 lbs,., lake trout up to 14 lbs, and browns in the 5 to 15 lb. class. Most of the fishing has been targeted at king salmon, which are scattered north of the harbor in 150 to 450 feet of water, just a few minutes run out of the harbor in our in our twin engine 28-foot charter boat. Proper presentation is the key to generating strikes from kings, this one boated on 4/30/15. I finally got a day off from a busy Lake Ontario trout and salmon fishing charter schedule, so what the heck was I doing on the water on the morning of July 6, 2015? The answer…, experimenting with a new trolling system geared to catching widely scattered kings. It took only a couple of hours. The 17 lb. king and 8 lb. steelhead in the box, plus a screamer that broke off, and another fish that didn’t hook up were proof of the pudding. The system worked. Trying to find the right bait or lure and getting a fish to hit it, is an age old challenge to anglers. Too little stimulus, and the fish ignores the bait or lure. To much stimulus and the fish avoids it. What makes fish tick? Well, there are lots of things to consider, not only lure or bait size , color or action, but speed of the lure through the water, available light, and water color, all underscored by fish activity level. For the troller, speed at which a lure is presented is critical. Troll a streamer for Mr. Lake Trout at 6.0 mph and forget it. Troll that same speed for Mr. Landlock in the right conditions, and hang on. Speed control while trolling shallow is easy using a surface trolling speed indicator or even just a trained eye and ear. Fine tune the action of a lure boatside as you adjust your trolling speed, then maintain that optimum trolling speed. Much has been written about optimum temperatures and trolling speeds for various gamefish. I once caught a 3 lb. lake trout 3 feet below the surface at 6.0 mph while trolling for landlocks, but I”ve watched a musky on my underwater camera approach a lure when the boat was dead in the water. There is no “bible” on trolling speed. Read the available info, then “sort the wheat from the chaff” based on your own experience. Remember effective trolling speed for any species may vary from day to day based solely on it’s mood. I believe one of a troller’s greatest pitfalls is trolling at a constant speed in the same direction. With 34 years as a charter captain, I’m still guilty of this, especially when the boat is on autopilot. When fish are hitting at a constant speed/direction, fine, troll at that speed/direction. When they aren’t, vary your speed. Erratic lure speed and direction often spell the difference between a good and a bad day. It’s often not trolling speed that catches fish, it’s changes in trolling speed. The number of lures anglers troll also affects success, especially on big waters like LakeOntario with multiple salmonid species scattered far and wide from the surface to 250 foot depths. Prior to about 1972, when trout and salmon were near the surface, most trollers fished flatlines, sinking fly lines, or shallow run lead core, and were physically limited to 2-4 lines to avoid tangles. With the advent of downriggers and planer boards, multiple lure presentation vertically and horizontally away from the boat became simpler, allowing charter boats like mine to run a standard surface spread of ten or more lines on planer boards and downriggers. As for preferred water temperatures, read the “Good Book” and remember what it says, but don’t use the info as the “Bible”. A hungry fish isn’t much of a reader and it doesn’t always follow the rules. Put some baitfish above or below it a few feet, out of it’s preferred water temperature, and it will ignore the written word. Remember, versatility catches fish. Learn to use a variety of fishing gear and techniques to be more successful. Small inline planer boards that attach directly to your line and fish out from the side of the boat are deadly for landlocks with streamers. In early spring, a Dipsy Diver rigged with your favorite landlock or lake trout spoon fished off the side of the boat with just 25 feet of line in the water is a killer. 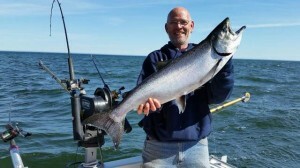 Thirty years of trolling bait on Lake Ontario has given me a ton of confidence in trolling meat for trout and salmon. Trial and error, success and failure, it has all gone into the equation of a trolling spread I now routinely use. It combines whole bait, Sushi Flies, and artificials. The bait of choice for me and Lake Ontario trout and salmon is the alewife. The best and only fresh frozen, vacuum packed alewives are the Familiar Bite brand available from Great Lakes Tackle Supplies. One of the questions I’m asked is how to prepare bait strips for Sushi Flies. First, though the Sushi Fly…, deadly for negative kings and a consistent producer of big kings on my charter boat. I rig all my Sushi Flies on 50# fluorocarbon leaders with a tournament tie, a 5/0 beak hook and a trailing #2 chrome treble. It’s the same tie used on unbaited flies, but I extend the leader length between the beak and treble hooks about 1 ½” so the treble trails an inch or so behind the mylar on the fly, approximately even with tail of the bait. Although, the alewife bait strip can be hooked on the leading beak hook, even a properly prepped alewife bait strip softens quickly in fresh water and seldom will stay on a hook very long. The secret to keeping an alewife bait strip secured inside the fly is to wrap it on the beak hook just behind the hook eye using soft .020” diam. brass wire. Although the brass wire can be attached to the beak hook on a Tournament Tie, I like to attach the wire before I snell the hook, by simply placing a 3” length of wire midway through the eye of the hook, pulling the brass wire down along the shank of the hook, and tying the snell over the wire, leaving about 1 ½ inches of each end of the wire extending to each side of the hook. 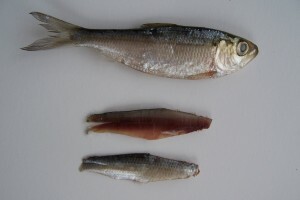 The strip of bait for a Sushi fly is filleted from a fresh or fresh frozen alewife, then trimmed to a an extended diamond shaped strip from 3 to 4 inches in length, about one inch wide at the widest point, 3/8” wide at the leadng end, and a half inch wide at the tail end. I usually split the tail end about one inch back into the strip to give it some flutter. The head end of a correctly shaped bait strip, tapered to about 3/8”, is then laid skin down against the shank of the beak hook, and the brass wire is wrapped from opposite directions around the bait with enough tension to slightly bury the wire into the meat on the bait strip. It is not necessary to twist the ends of the wire together to hold the strip. The wired bait will remain in the fly as long as you fish it. I prefer lightly dressed flies for use with bait strips. Fresh, high quality bait is the key.